Which method are you using to import? @BenBob: Unfortunately what 1Password imports is only as good as the source data, which can often be incomplete or in a strange format. So while it isn't something we can do for you, if you'll give us some details we can probably suggest something. MRC I am using the method specified on the 1Password website, directions for migrating from Roboform. Can I suggest you try the roboform converter in the converter suite instead? Just follow the download and directions. If you have an issues, I'm here to help. MRC, thanks I'll look at that also. MRC, before I try the procedure you mentioned or the one sent to me by JD, I need to delete all the listings in my account. I have tried 2 migrations and now I have duplicates of everything with the wrong information. How can I start fresh? I cannot find the answer in the help support. There is a Tags section on the left side bar. Expand the Tags area, and you will see some tags. When you import items, they are tagged with the import date. You can select the tag, and this gives you access to select those items, which you can then delete. MRC, very strange how my screen looks so much different. I'm slowly deleting individual items one by one. Going to take a long time. Down to 600 left! 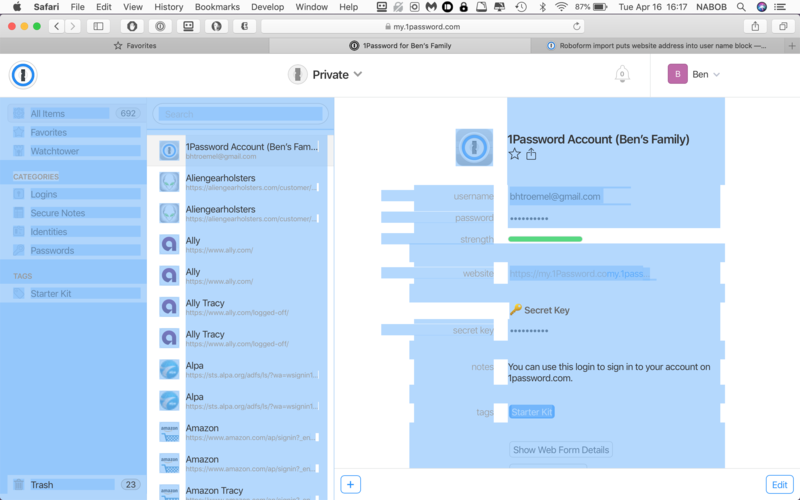 I am really confused why 1Password is being so user unfriendly to me. I was expecting much better! This is very odd but I'm trying to hang in there because I was looking forward to switching. 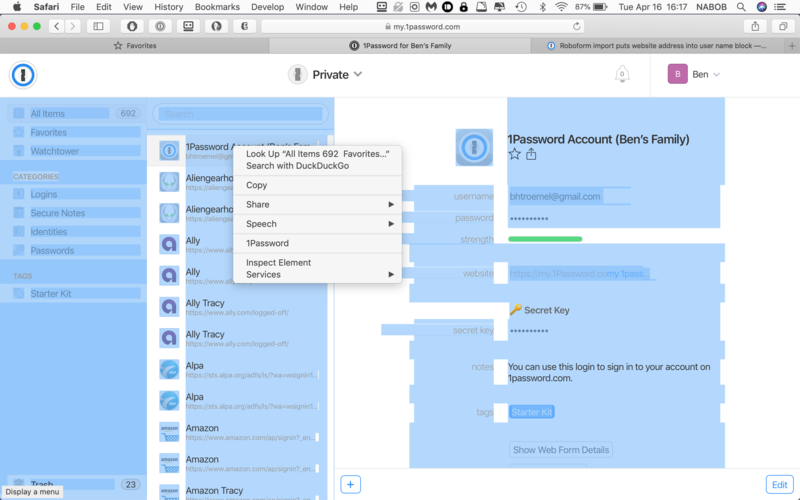 You'll find the Desktop app to be much more "friendly" than the web client. Web-based apps are in almost all cases less feature-rich than the native macOS apps. Web-apps are much more simplistic. Lars, thank you so much! I thought it had something to do with that (being on the website) but when I clicked on my 1Password for Mac it looked different. Now I realize I have to click on the gear for settings and then "open 1Password". Working on it now! OK, MRC and Lars I got everything deleted! Now I am going to uninstall 1Password and then reinstall and try another migration method. Thank you for all the help! There's no reason to uninstall . I'm wondering why you are doing that? OK Mr MRC, I tried doing the conversion with your MacOSConvertHelper.app but it doesn't seem to work the way you say. I get what is shown in the below screen shot. I tried to follow your instructions to do it manually in the terminal but I am a little lost as to what exactly to type into the terminal (I have used terminal a little in the past). Thanks again. I don't see a screenshot above. 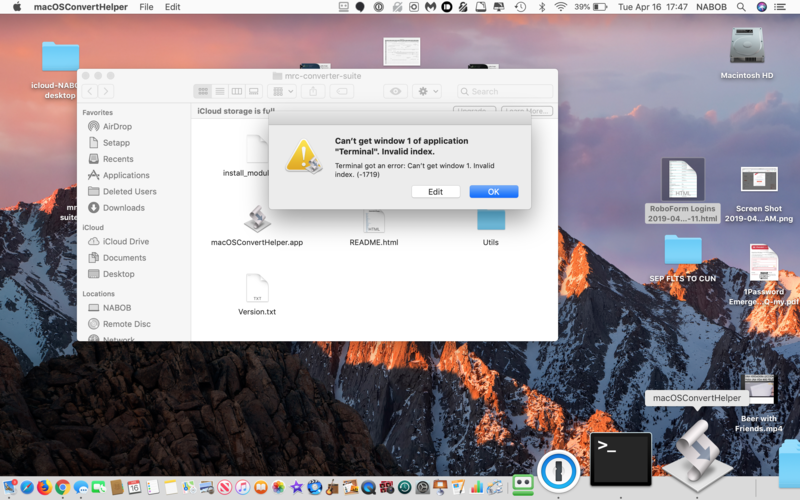 I just ran MacOSConvertHelper on a brand new Mojave virtual machine, and it ran fine. Can you elaborate? 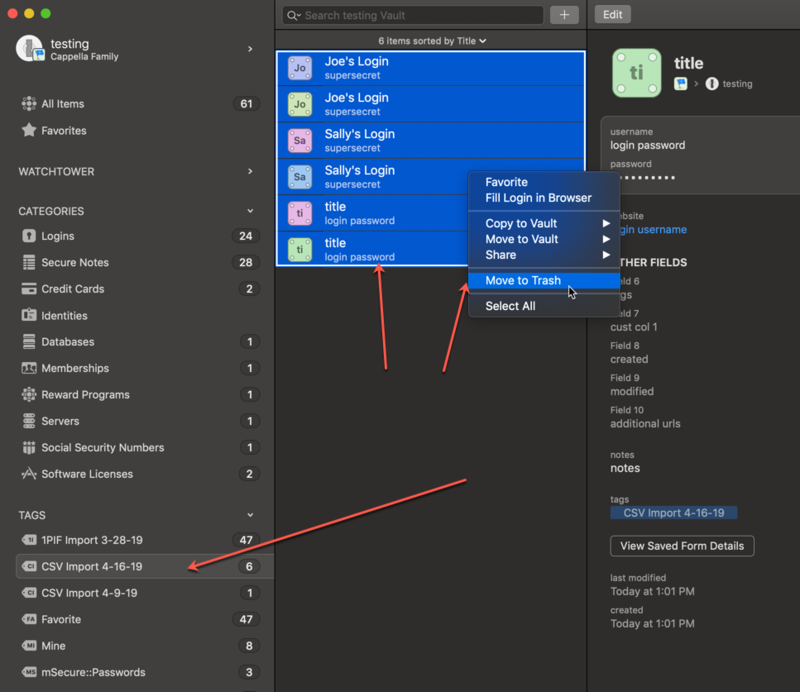 You can see above my export file name was roboform_mac_logins.htm and it was on the Desktop. The .htm file was a print list, as per the Roboform export directions in the README.html file. If you followed the instructions there, it will guide you through the process. For some reason the screen shot did not post -- and then the system blocked me for 300 minutes. I will try again. Ah, this can happen when users don't accept the macOS prompt to allow terminal to be controlled by the helper. There was a prompt that asked for access. Just open a new Terminal window manually, and then re-try the helper app. If it will help you, I'm happy to provide you with some remote assistance. MRC, my latest update: Your converter was fantastic and has gotten me on the road to using 1Password. I am now in the process of trying to clean things up and learn how to use 1Password. Thank you so much for all the help! @BenBob - on behalf of myself and MrC (who did most of the real work), you're quite welcome! Glad you got things all set.